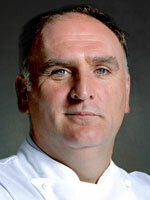 José Andrés is an internationally recognized culinary innovator, author, educator, humanitarian, and committed advocate of antihunger issues. Andrés is known for his groundbreaking avant-garde cuisine and his award-winning group of 31 restaurants and one food truck located throughout the United States, Mexico City, and the Bahamas. Andrés is the only chef globally that has both a two-star Michelin restaurant and four Bib Gourmands. He was named one of Time’s “100 Most Influential People” in both 2012 and 2018 and was awarded “Outstanding Chef” and "Humanitarian of the Year" by the James Beard Foundation. In 2012, Andrés formed World Central Kitchen, a nonprofit that provides smart solutions to hunger and poverty by using the power of food to empower communities and strengthen economies. Most notably, World Central Kitchen, along with #ChefsForPuertoRico, served more than 3.5 million meals to the people of Puerto Rico following Hurricane Maria. Andrés’s work has earned awards and distinctions including the 2017 Lifetime Achievement Award from the International Association of Culinary Professionals and the 2015 National Humanities Medal. He is one of 12 distinguished recipients of the award from the National Endowment for the Humanities. Andrés was also named “EY Master Entrepreneur of the Year” in Greater Washington for his leadership and impact on the global business community and was awarded the Congressional Hispanic Caucus Institute’s Chair’s Medallion Award. NAFSA thanks George Mason University for their generous support.